Proven Results: The SmartTrack® material and SmartForce® features are clinically proven to improve control of tooth movement with Invisalign clear aligners. Better Fit: Aligners made from the SmartTrack material are comfortable, fit well, and are easy to put on and take off. Comfortable: Invisalign clear aligner trays are not only smooth and comfortable to wear, but they’re also removable. That means you can continue doing all the things you normally would, from brushing and flossing to eating whatever you like. You can even play sports with Invisalign. Just take the aligners out, hit the court, and put them back in when the buzzer sounds. Convenient: Invisalign treatment is ideal for your busy schedule, as your visits are less often than with braces. Easy to Care for: Caring for Invisalign is a cinch. Just take out the clear aligners, brush them, and put them back in. That’s much easier than trying to get food out of braces. Don’t be nervous about getting Invisalign. The process is incredibly simple, and it won’t be long before you have straight teeth. You’ll start with a trip to the dentist. Your dentist will capture a 3-D mold of your teeth and build a roadmap to your new smile using ClinCheck software. You’ll even get to see what your smile will look like before you begin your treatment. You’ll be excited when you see how much better your smile will look at the end of your treatment. Your dentist will also map out your treatment plan, including the number of times you’ll need to switch aligners during the process. 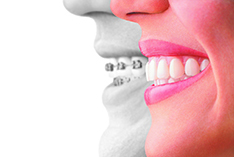 Then, your scans will be sent to the Invisalign lab, and a technician will make the aligners. Each aligner will move your teeth to the desired location. Then, the next aligner will take over, pushing the teeth closer and closer to that straight smile you’re craving. Your dentist will need to examine you to give you a treatment timeline. However, most adults wear Invisalign for around one year. Keep in mind that you have some control over the treatment timeline. Keep your aligners in as much as possible to shorten the time you’ll have to wear them. If you take them out too often, they won’t be able to do their job, so you’ll have to wear them longer.